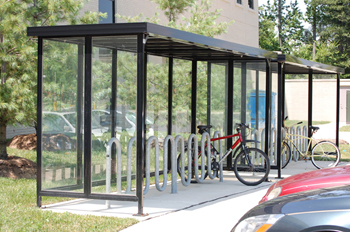 Bus shelters are a necessity for any large facility whose employees rely on public transportation or shuttle service to get them to and from work or to other areas of the property. Transportation shelters offer employees, visitors, and clients a protected area that will shelter them from the elements while they wait for their vehicle to arrive. From hospitals to government facilities to senior care centers and more, there are many types of facilities that can benefit from the addition of a bus shelter. At Shelters Direct, we offer prefabricated bus shelters that provide many advantages. Learn more in today’s blog, below. Prefabricated bus shelters are the way to go. One of the greatest benefits of a prefabricated bus shelter is that they are economical and cost effective. On-site construction is often saddled with many unanticipated costs that can drive up the final price of your bus shelter dramatically. In order to avoid these headaches, we provide prefab designs that are offered in our popular aluminum, which comes knocked down and crated, or in steel which is welded and arrives fully assembled. At Shelters Direct, we can help you with your needs, whether simple or complex. We offer three-sided or four-sided prefabricated shelters and can accommodate any configuration that is needed. We have a long list of additional features such as different roof styles, full wall panels, full glass panels, benches, electrical options, infrared heating, etc. Though prefab bus shelters may be cost efficient and quick to assemble and install, this does not mean that they lack quality. On the contrary, our bus shelters are built of high-quality aluminum or steel and they are designed to last for decades and withstand the effects of inclement weather. Each of our aluminum shelters is engineered to take into consideration the snow and wind roads of the specific area they are going to. This ensures durability of the product. For over 15 years, Shelters Direct has been a trusted source for the supplying and installation of prefabricated bus shelters as well as canopies and booths. We work with a wide variety of clients throughout the United States and abroad to provide quality products and expert installation so you can be confident that we will get the job done right. Interested in learning more? Contact us today! And don’t forget to keep up with us on Facebook, Twitter, Google+, and LinkedIn too. This entry was posted on Thursday, March 31st, 2016	at 2:33 pm	. You can follow any responses to this entry through the RSS 2.0	feed. Both comments and pings are currently closed.